The Chonos Route explores the Northern Ice Field, which is located in the Southern Patagonia. Its area is 4400 km2, 100 kms long from north to south and it is 40 kms wide from east to west, its ice cover approximately 70 glaciers. This mass of ice is the place where the closest glacier to the Equator that descends to the sea, the San Rafael Glacier which covers 15 km, between Monte San Valentín to the homonymus lagoon. San Rafael Glacier & Quitralco: The Northern Ice Fields. was built in 1988 by the very same shipyards of the Kochifas family. The ship is 70 metres long and 10 metres beam, and almost 3 metres of draught. Its cabins are decorated with wood which are distribuited in 5 decks, all of them with private bathroom, TV LCD and background music. Accommodations can be marital or twin cabin. The ship offers two stylish bar rooms, one of them is the main dinning-room or Quitralco room allowed for smokers and the other one is the San Rafael Bar allowed for non smokers. The M/N Skorpios II can accommodate 130 passengers, il sets sail every Saturday and returns on Tuesdays, and it has exits from september to may. It sets sail from the port station of Skorpios in Puerto Montt, the most important city in the Lakes District, which dates from 1853 and it is located in front of the Seno of Reloncaví. During the crossing, the crew will give all their experience and you will be able to enjoy an excelent level in their gastronomy for discerning people, thanks to the chef who will make you taste delicious regional dishes which are elaborated with shellfish and regional meats, respecting the culinary tradition of the Patagonia, where spider crab, mussel, oyster, salmon, corvina, sea bass and conger eel, and also curanto a traditional dish in the millenial gastronomy of Chiloé, which will be allways go with the excellent company of chilean fine wines, which are considered like one of the best in the world. The M/N Skorpios II ferry sets sail from the chilean city of Puerto Montt, in the Lakes District so we can start the Chonos Route´s navigation (San Rafael Glacier). Puerto Montt is the capital of Llanquihue province and the X Lakes´ Region. We will leave the Archipelago of Llanquihue which is famous because of its lake that is the most important tourist centre in the area. We will be able to sight the old city of Calbuco, which dates from 1603, it belongs to the same region. Later, the navigation route will go to the Gulf of Ancud that divides the Chiloé Island and the Archipelago of the Greater Island of Chiloé from the continent, leaving the Gulf of Corcovado aside. Day 2 - Navigating along the Moraleda and Ferronave channels. Very early in the morning, we will cross the San Rafael waters and the Témpanos Channel. During the morning, the ferry will come into the lagoon to anchor at only 2 kilometres far from the San Rafael Glacier. Before midday, we will embark on boats to enjoy and watch the ice floes which give life to this amazing landscape, as long as the weather conditions will allow us to. In the afternoon, we will get closer even more to the glacier and finally we will go to Quitralco Fjord. On our fourth day route, the Quitralco Fjord will be waiting for us, which we will enjoy very close so we can know it while we are navigating on rubber boats. After breakfast, we will be able to take advantage of hot baths with an average temperature close to 32ºC. In the afternoon, we will go to Chiloé Island to explore the Moraleda and Pérez Norte channels. The Moraleda Channel gets wider in its two branches, Costa and Estero Elefantes. Day 5 - Gulf of Corcovado, Estero de Castro. We will cross the Gulf of Corcovado, so we can have the possibility to watch blue whales or alfaguara. 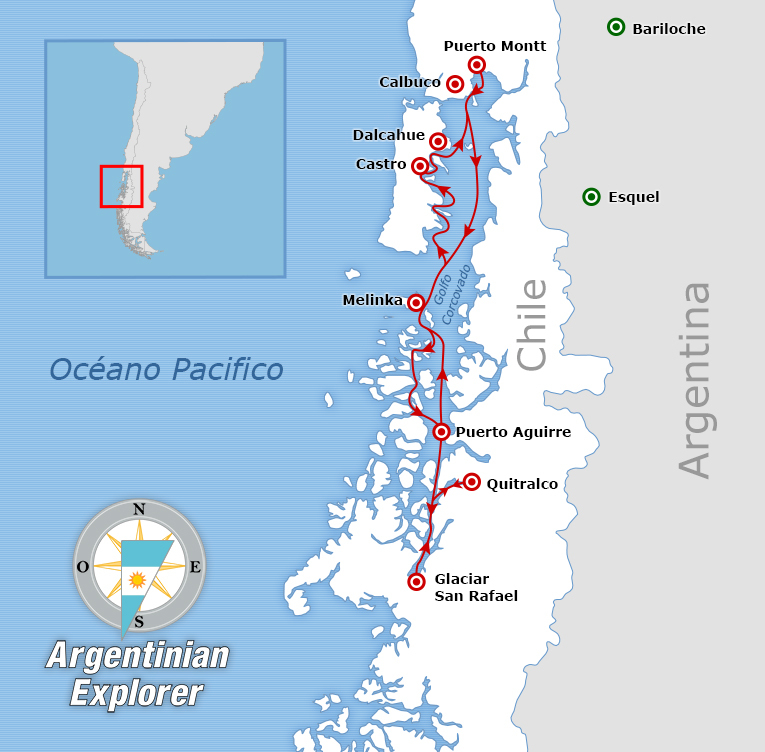 We will continue our route navigation going round the west coast of Chiloé to Yal Channel so we can disembark in the seaside coast of Estero de Castro to go visit it. At night we will go back to the ship so we can embark in Puerto Montt along the Lemy, Dalcahue and Quicaví channels while we get ready for the dinner and the farewell party in which there will be a ball. We will dock very early in the Skorpios Terminal in the port of Angelmó. Once we got our breakfast, we will disembark saying goodbye to this adventure along the Northern Ice Fields.